You attack Brees and hope that your DL can win at the POA. 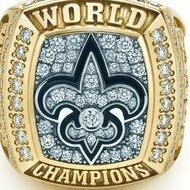 It has been rarely done, but that’s how you beat the Saints. And the Rams should have had the personnel to do it but failed miserably. We get the ball out super quick this year, so you gotta be fast or it's all for nothing. I mean, Brees always has, but we very rarely throw deep anymore. An our oline might be the best in the game. Alternatively, you can hope Brees has a bad game and is off target. I can think of several games. Happens to everybody. It's less likely to now, because our team is better. My point was that if the only way you can beat the Saints is hope and pray Brees has a bad game, you're in trouble. Not that it is actually a legit strategy to beat the Saints, although it has happened. Browns? That's pretty awesome to hear. He said he was waiting for the right situation, not the money. Good for him, hopefully good for us, too.